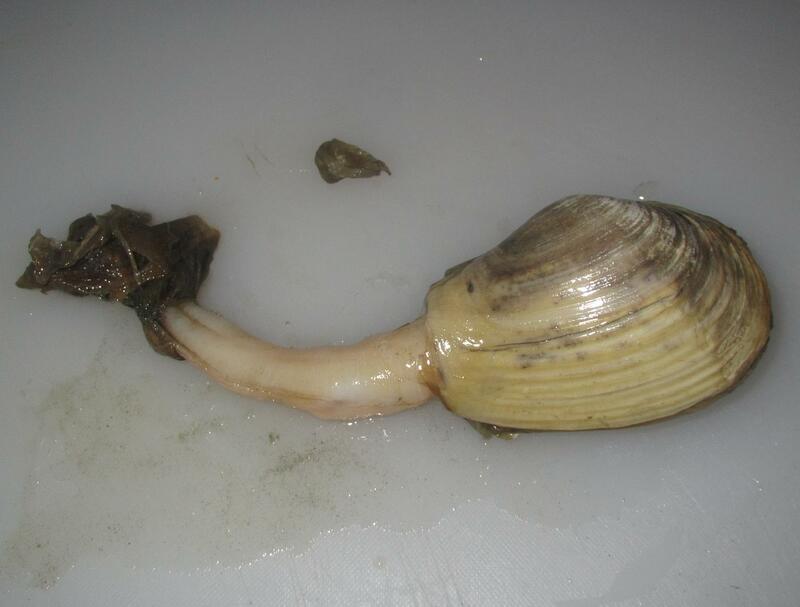 Clams need to be purchased, or harvested, while they are still alive, and then kept that way until it comes time to eat them. They keep well in the fridge in just a covered container, but it is best to keep them in a large vessel containing seawater, or if not available, fresh water with salt added at about 1/3 of a cup per gallon. A further advantage to this is that, if left for many hours, or overnight, the clams will purge themselves and empty their digestive systems. There is nothing wrong with omitting this step, but clams also take in a lot sand, making them occasionally gritty, and this process can reduce that somewhat. I once read that adding cornmeal to the water helps the clams to purge and I thought I would give it a try with this batch. 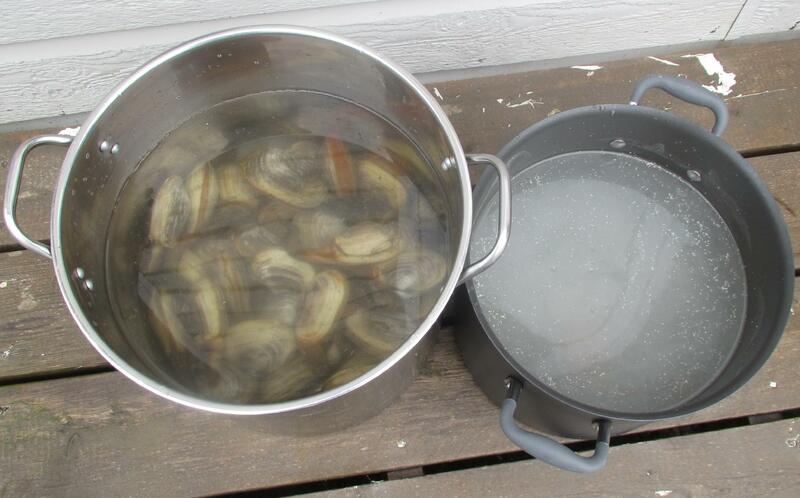 The large container on the right holds about 30 odd clams in just plain salt water, while the rest are in the smaller container to which about a cup of cornmeal was added. To be honest, after leaving them overnight and then comparing the stomach contents of one from each container, I couldn’t tell much difference. There is a layer of ‘skin’ covering the neck that needs to be removed before consumption. 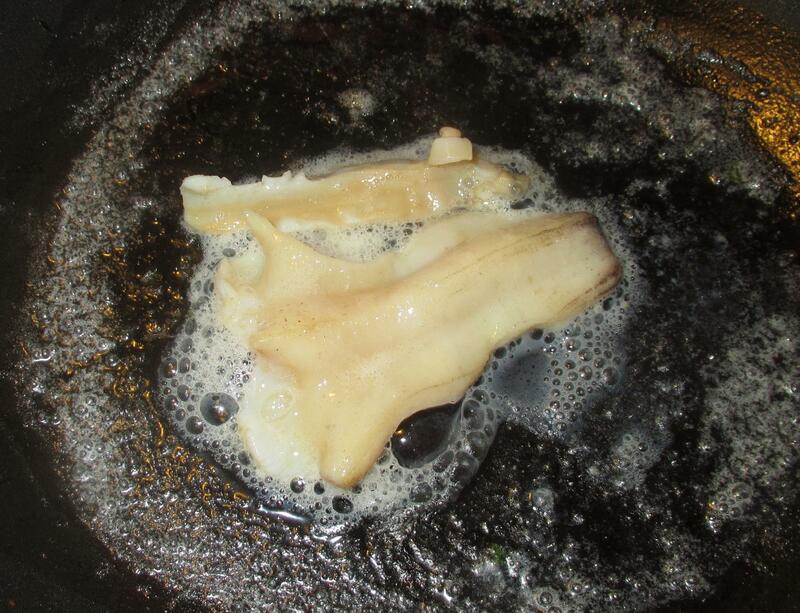 With the large Geoducks, cooks sometimes blanch the shellfish in boiling water for a few seconds to make the job simpler, but with these, the membrane is easily slipped off. Opening, or ‘shucking’ clams, especially the softer shelled varieties, is way, way easier than doing the same with oysters. All you need do is to insert a thin bladed knife into the shell opening and slide it around with the blade against the inside of the shell so as to sever any connections. This needs to be done on both sides and then the shell comes easily away. 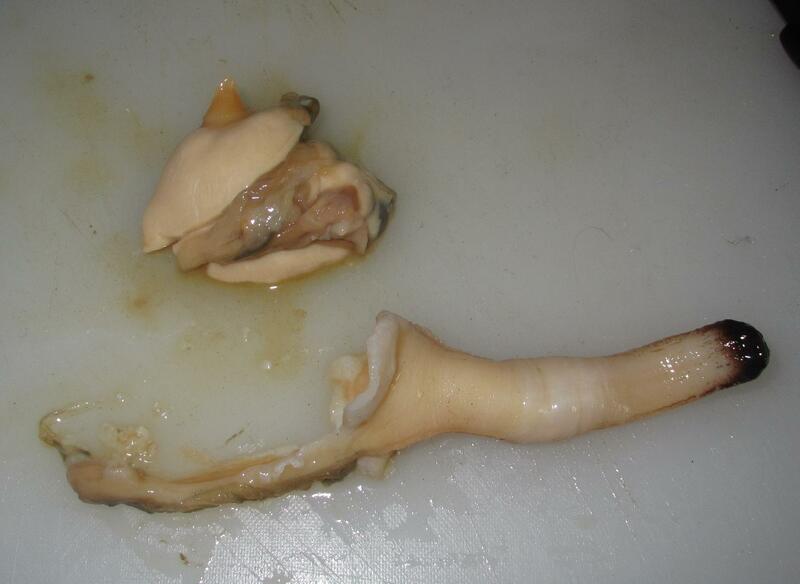 Once removed, you can see that the clam essentially consists of two parts: the ‘neck’ and an attached piece of similar tissue, along with the softer ‘belly’ parts, or internal organs. In many restaurants, fried clams will be the ‘strip’ variety, consisting of just the meaty neck and internal muscle but, In New England especially, you can order clams ‘with belly’ which essentially consists of everything. Some people dislike having the ‘belly’ included but this is the part that many regard as having the best ‘sea’ flavor. This picture shows things a little more clearly with the ‘belly’ part detached from the rest. It’s up to you whether or not you discard the softer bits but it is such a shame to waste. 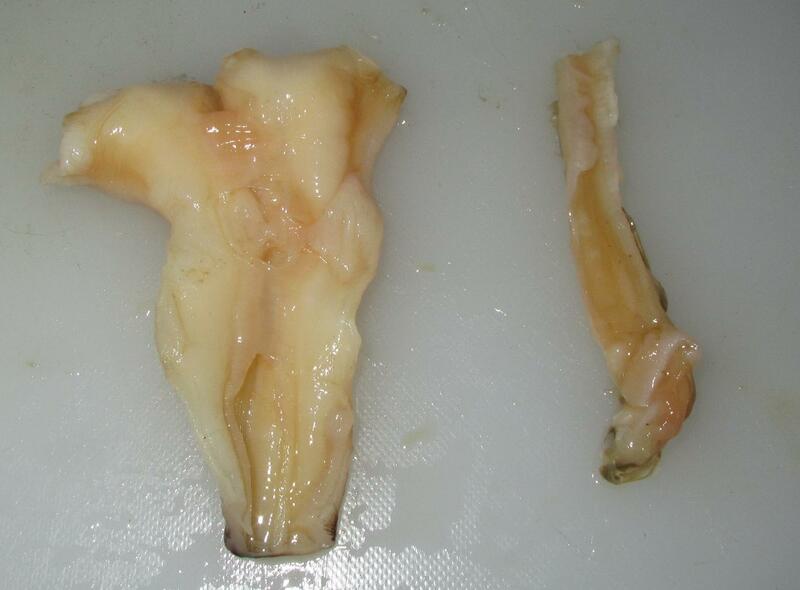 Here, I have opened up the neck and cut away the portion that lies within the shell. The meat is very dense and firm and has a nice texture to it. Depending on the thickness of the meat, and the manner of cooking, I might be inclined to score the flesh here and there if the pieces are going to be eaten whole. 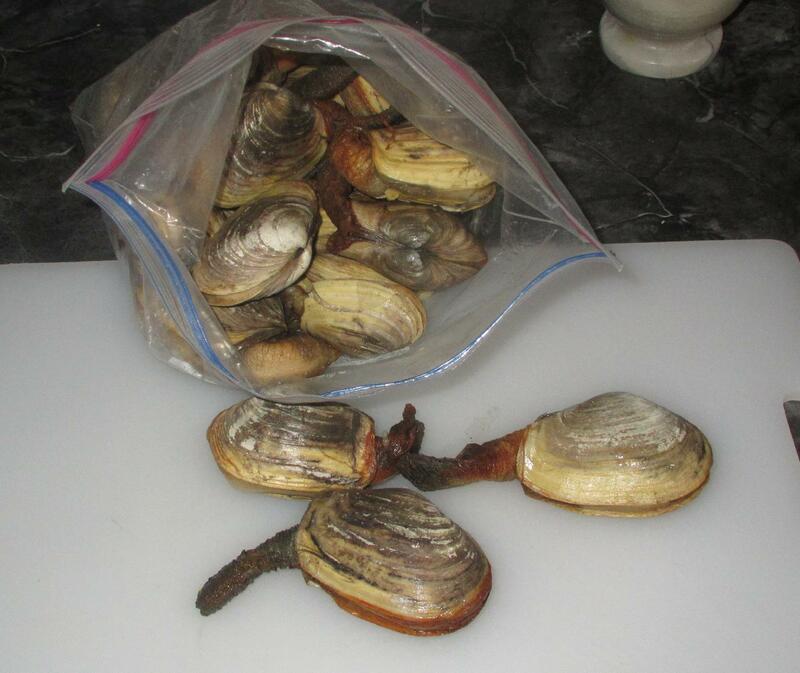 The first time I ate these clams was straight from the bag (ie: raw) outside the ‘courthouse’ in Qikiqtarjuaq. Quite honestly, although raw oyster on the half-shell is just about my all-time favorite food in the whole world, I can’t get nearly excited about eating whole clams this way. 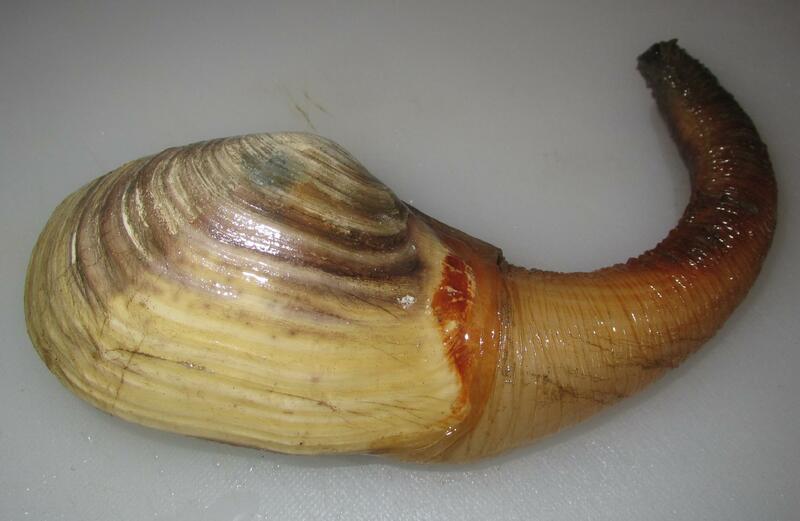 The neck meat, however’ (should your clam be of a similar type), makes a lovely sashimi. 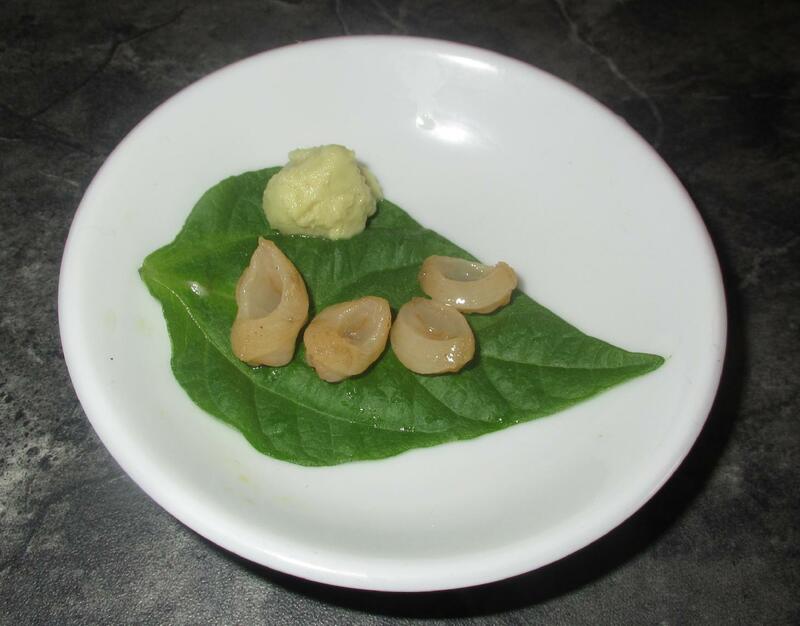 Above, you can see just a couple of sections sliced thinly from the siphon and served with a bit of wasabi. 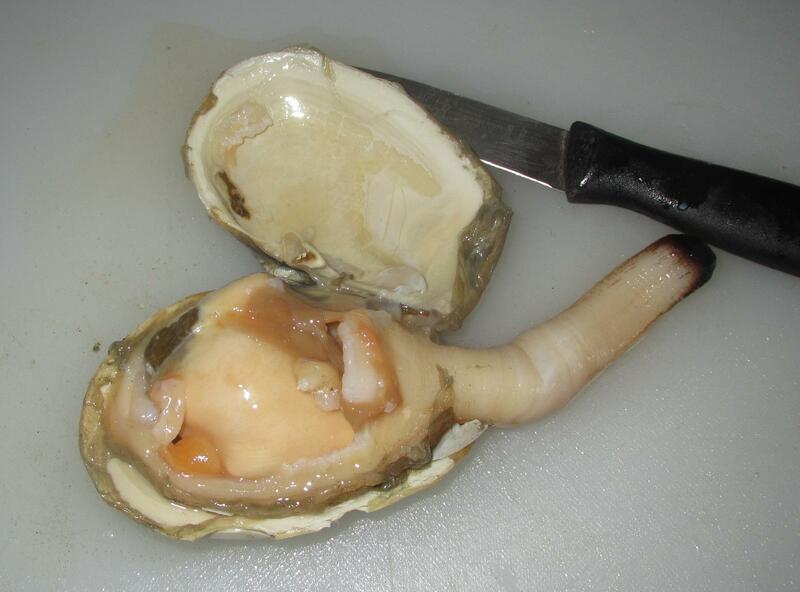 If raw shellfish is not your thing and you would like to get a good idea of the fresh ocean flavor of a good clam, try sautéing the neck meat in just a little butter just until it turns white (just a minute or so over medium heat is enough). I guarantee that the taste, and the texture, will be like the best and sweetest lobster tail you have ever eaten. Informative! We are soon moving to the coast, so I’m interested in knowing more about all types of shellfish and fish. 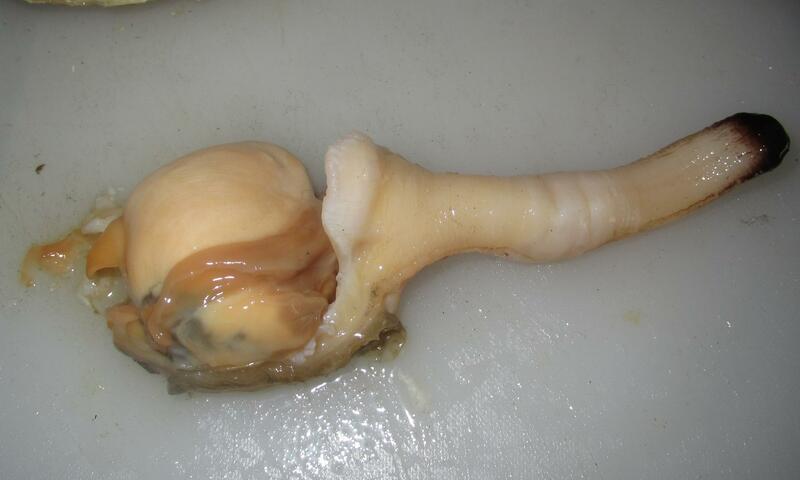 Those do look delicious and I was actually thinking that they looked like little geoducks. What a terrific score. I don’t think that we will ever get clams like that out here. All the more reason to travel, no? just got back to iqaluit with my bag of mixed clams and wish i’d read this before cleaning them the way i did – would have let them sit overnight! but thanks for the cooking options – i am not a big filter feeder eater, and so needed some more ideas about the cooking. I don’t suppose you’ve ever gotten a better idea what type of clam they are?